The ash tray is marked on the bottom "© 1933 W.C. Anderson." 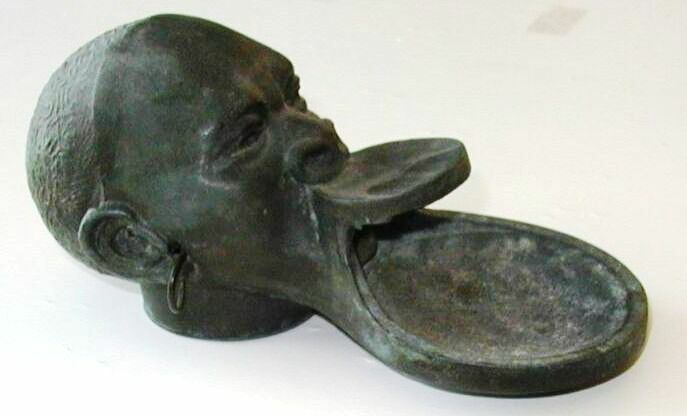 It was probably sold in stores to capitalize on this widely publicized circus exhibit of the Ubangis, the saucer-lipped natives from French West Africa. The value is $150-200. In an earlier article, I told the story of a dear friend, Charlotte (Shive) Maxwell, who ran away and joined the circus. You can read more about Charlotte and her experiences in that story, Fascinating Story Behind Antique Circus Wagon Wheel. This is one of the many different posters used to promote this one-of-a-kind attraction. Text on the poster says “Greatest Educational Feature of All Time. Tribe of Genuine Ubangi Savages New to Civilization from Africa’s Darkest Depths! With Mouths and Lips as Large as Those of Full-Grown Crocodiles!” Value of this poster is $500-$750. Over the years, Charlotte told us many stories about her life in the circus. One that stands out was her relationship with the Ubangis, the saucer-lipped natives from French West Africa. 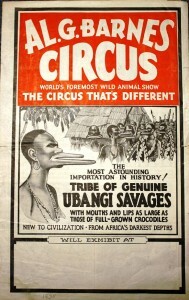 The Ubangis first appeared with Ringling Bros. and Barnum & Bailey in 1930. They were members of the Sara tribe and were from Chad in Central Africa. 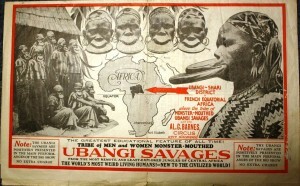 Ringling Publicist, Roland Butler, named them Ubangis after the Ubangi River, which was actually several hundred miles from where this tribe lived. While they were with the show, Charlotte developed a close friendship with one of the women of the group. As the season was about to end they began their goodbyes. The Ubangi woman indicated that someday Charlotte should come to Africa to visit her. Charlotte jokingly replied she was afraid to do that because they might put her in a pot and cook and eat her. This really hurt the Ubangi’s feelings. To reassure Charlotte, she brought her a parting gift—a bracelet which she had fashioned out of bailing wire taken from one of the many hay bales delivered daily to the show grounds. This bracelet was made by one of the Ubangis women using bailing wire from bales of hay. Charlotte says the women made these bracelets, using their teeth to wrap the wire. To give an evaluation on a one-of-a-kind item like this is very difficult because there are no sales records to compare. 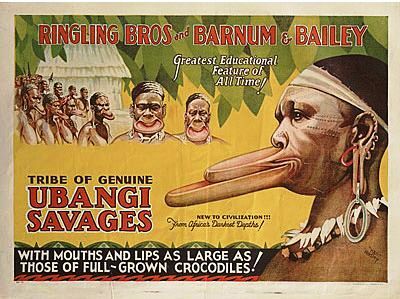 After their appearance with Ringling, the Ubangis went to the Ringling-owned, Al G. Barnes Circus, and later made an appearance with the Canadian National Exposition in Toronto. 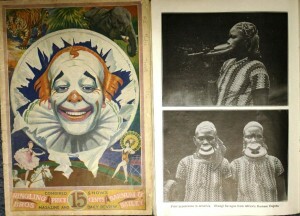 Cover and inside page of the 1930 Ringling Bros. and Barnum & Bailey program. The text under the Ubangi photos says: First appearance in America. Ubangi Savages from Africa’s Darkest Depths. 1930 Ringling Barnum programs are valued at $30 to $50. For more information about circus programs see my article, Circus Programs: Souvenir Magazines a Colorful and Plentiful Collectible. After their exhibition on the Ringling show, the Ubangis spent some time in the Al G. Barnes Circus which was owned by Ringling Bros. and Barnum & Bailey. For more information on circus couriers se my article, ‘The Circus Is Coming!’ Circus Couriers Whet Communities’ Appetites..
Larry Kellogg is a WorthPoint Worthologist specializing in circus memorabilia. Ladies, Gentlemen and Collectors of All Ages . . .